From Gold, take Rte 49 south about 1.5 miles. Cemetery is on the right. Updated with contributions from our users. Where noted, some entries have been expanded with cross-references to census data. To view the census data, open the census cited and search for a name. * denotes a birthdate calculated from the given death date and age at death. AMIDON, H. Clair. Spouse of Bess B. Born 1884, died 19?? BAKER, Irene. Spouse of Martin L. Born 1924, died ?? BRADISH, Ira N. Spouse of Josephine. Born 1866, died 12-7-1942 - Section boss for the railroad. BUCK, Robert A. Spouse of Jeannette Morley. Born 3-1-1935, died 11-27-2008. Age: 73 - Son of Lawrence E. and Mabel (Evans) Buck. Born in Coudersport PA. Wed 4-4-1959. 4 children. CADY, Leaman L. Spouse of Lydia K. Hawks. Born 1854, died 4-12-1929 - Son of Elias and Mary Ann (Garlic) Cady. Wed 7-15-1877. CAREY, Grace A. Born 1892, died ?? CLARK. Born 5-6-1897, died 5-6-1897. Age: Infant - Prob dau of William R. and Sarah (Morley) Clark. CLARK, William Raleigh. Spouse of ?/ ?/ Sarah J. Born 1840, died 2-28-1920 - Civil War Vet, Co G, 46th PA Vols, Sgt. Promoted from Cpl. to Sgt. on October 13, 1864 - mustered out with Company on July 16, 1865. COLLINS, J. L. Spouse of Fanny P. Born 9-24-1830, died 5-19-?? COLLINS, Mattie (Monroe). Spouse of ??. Born 6-6-1865, died 7-6-1903 - Dau of Emmer B. and Nancy (Morley) Monroe. CONABLE, Frank H. Born 2-10-1888, died 1-31-1892 - Son of George E. and Marian E. (Parker) Conable, born in Sunderlinville PA.
CONABLE, Marian Elinora. Spouse of George E. Born 3-4-1869, died 10-14-1944 - Dau of George W. and Lucinda (Kilbourn) Parker, born in Sunderlinville PA.
CONABLE, Max D. Born 11-14-1897, died 5-7-1933 - WW I Vet, PA Corp 411 Tel, Bn. CONABLE, Nina. Born 2-14-1894, died 2-17-1894 - Dau of George E. and Marian E. (Parker) Conable, born in Sunderlinville PA.
CRAIN, Elvernon [Vern]. Spouse of Evelyn Snyder. Born 8-28-1932, died 7-28-2017. Age: 84 - Son of John and Viola Crain. Born in Towanda NY, lived in Coudersport PA, died in Bradford PA. Drove dump truck for many years. Wed 12-18-1964 in Sweden Valley PA, five children. DARLING, Clarendon R. Born 3-1843*, died 9-19-1865. Age: 22y 6m - Drowned - Civil War Vet, Co H, 46th PA Vols, Sgt. Discharged on Surgeon's Certificate - date unknown. DAVEY, Florence M. Born 12-22-1910, died 12-3-1921 - Dau of Albert and Dorothy (Fuller) Davey. DAVIS, Edith E. Spouse of Frank H. Born 12-27-1882, died 1-19-19779. Age: 94 - Dau of Silas and Emma (Hamilton) Brooks. Born in Watkins Glen, NY. Wed Sept 1, 1901. DAVIS, Frank B. ] ]. Born 1-12-1912, died 1-3-1992. Age: 79 - Son of Frank H and Edith E. (Brooks) Davis, born in Coudersport. DUNN, Ada L. (Leete). Spouse of Theodore S. Born 1892, died 1971 - Wed 5-7-1913. DUNN, Donald Robert. Spouse of Pruella Edith Toombs. Born 10-25-1913, died 8-14-1954 - Son of George William and Minnie (Carpenter) Dunn, born at Seven Bridges PA.
DUNN, Donna A. (Nelson). Spouse of Guy G. Born 2-1-1929, died 4-21-1989 - Wed 12-14-1957 in Coudersport, 5 children. Stone has picture of thier farm sketched on it. DUNN, Minnie (Carpenter). Spouse of George William. Born 1-1872, died 7-11-1965. Age: 91 - [Daughter] Dau of Theodorus and Janette N. (Moore) Carpenter, broorn in Newfield PA. Wed 6-25-1890, 7 children. (1900, 1920 Allegany census). DUNN, Richard Vernon. Spouse of Alberta Nelson. Born 3-17-1918, died 11-8-1981 - Son of George William and Minnie (Carpenter) Dunn, born at Seven Bridges PA.
DUNN, Sarah Elizabeth (Ellison). Spouse of Michael. Born 10-11-1844, died 10-2-1918 - Dau of E. J. and Mary (Henley) Ellison, born in Frankliin Co TN. Wed 12-15-1863 in Franklin Co TN, 6 children. DUNN, Vera Arvilla. Born ?? DUNSHIE, John M. Spouse of Harriet E. Hitchcock. Born 1831, died 6-19-1867 - Son of Ebenezer and Eleanor (Holmes) Dunshie. Killed when a large pile of logs rolled onto him while working at Raymond sawmill. EASTMAN, Erma S. Born 1900, died ?? EASTMAN, Hazel M. Born 1895, died 19?? ERWAY, Lewis S. Spouse of Elnor A./ Blanche A. Born 6-1872, died 12-20-1949 - 1900 Bingham Census: Wed 3 yrs to Elnor A. 1920 census, wed to Blanche. ERWAY, Nancy B. (Barnett). Spouse of Dale E. Born 9-18-1942, died 6-17-2011. Age: 68 - Dau of Robert R. and Lucille (Scott) Barnett. Born in Coudersport. Wed 2-2-1963 in Gold PA, 4 children. FERGUSON, Agnes E. (Chandler). Spouse of Mark J. Born 4-6-1908, died 9-6-1997. Age: 89 - Dau of Arthur William and Elizabeth (Bower) Chandler, born in Hornell NY. Wed 10-30-1926, at least 6 children. FERGUSON, Mark John. Spouse of Agnes E. Chandler. Born 6-7-1904, died 5-25-1972. Age: 68 - Son of Samuel Sidney and Mary P. (Nisbet) Williams Ferguson. Wed 10-30-1926, at least 6 children. FERGUSON, Samuel Sidney. Spouse of Mary P. Nisbet. Born 4-24-1860, died 5-27-1942. Age: 82y 1m 3d - Son of Ansel and Harriet (Quick) VanCise Ferguson. 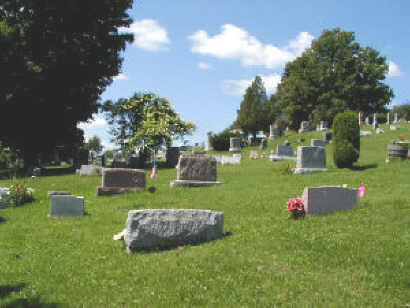 Mother buried in Sharon Center cemetery. FULLER, Claire E. (Rogers). Spouse of Henry D. Born 1887, died 2-21-1966 - Wed 9-16-1908. FULLER, Daniel. Spouse of Sophia. Born 12-1-1831, died 8-31-1922 - Civil War Vet, Lost an arm at Antietam - some sources say both arms. FULLER, Floss Estell. Born 9-13-1874*, died 10-24-1876. Age: 2y 1m 11d - [Daughter] Dau of Daniel and Sophia Fuller. GALPIN, Glen Cora (Dunn). Spouse of Riley. Born 10-11-1875, died 11-6-1904 - Dau of Michael and Sara E. (Ellison) Dunn, Born at Seven Bridges PA. Wed 12-11-1894, 2 children. GALPIN, Riley. Spouse of Glen Cora Dunn. Born 1867, died 12-30-1942 - Wed 12-11-1894, 2 children. GILL, Dexter L. Spouse of Edna M. Hilfiger. Born 1887, died 19?? GOULD, Lucy A. (Long). Spouse of Donald E. Born 2-14-1931, died 1-29-2011. Age: 79 - Dau of Edwin E. and Marjorie A. (Perkins) Long. Three children. GREEN, Anna E. (Reynolds) Sheon. Spouse of ? Sheon/ Erville L. Born 1880, died 8-1-1962 - Prob dau of Laderney and Permelia Reynolds. (1920 Allegany Census) At least 2 sons surnamed Sheon. Wed Erville 12-25-1907. GREEN, Daniel. Spouse of Sarah A. Born 1843, died 1926 - Civil War Vet, Co E, 1st NY Dragoons, Cpl. GREEN, Erville L. Spouse of Anna E. Reynolds. Born 1870, died 11-4-1961 - Wed 12-25-1907. GREEN, Helen M. (Yeager). Spouse of ? Bisnett/ Fordyce. Born 11-18-1932, died 1-14-2005. Age: 72 - Dau of Clifford and Mildred (Harrington) Yeager. Born in Coneville PA, a day laborer. Wed 1-7-1979 in Genesee, 3 sons, surnamed BISNETT. HOPKINS, Samuel L. Born 7-26-1830, died 4-23-1902 - Civil War Vet, Co H, 53rd PA Vols, Pvt. Discharged by General Order on May 15, 1865. JORDAN, Donald. Born 1929, died ?? JORDAN, Ida F. (Morley). Spouse of Clarence L. Born 1887*, died 12-22-1942. Age: 52 - Wed 9-16-1908. JORDAN, Mary. Born 1929, died ?? KIDNEY, Eliza M. (Green). Spouse of Millard F. Born 1880, died 19?? - 1900 Allegany census gives birth as 9-1876. LANGAN, Frank Arthur, Jr. Spouse of Margie R. Bush. Born 4-14-1926, died 4-1-2011. Age: 84 - Son of Frank and Rachel E. (Parsons) Langan, born in Crosby PA. Wed 10-31-1955 in Ulysses PA, 8 children. LINCOLN, William P. Spouse of Ann E. Herz. Born 3-9-1928, died 12-12-2015. Age: 87 - Son of Ralph and Sarah (Rhodes) Lincoln, born in Fairchance, died in Wellsboro PA. Wed 3-18-1950 in Morgantown WV, three children. (She d. 12-16-2008) - WW II Vet, US Army and Army Air Corps. 24-year career. LONG, Lillian I. Born 1887, died ?? MERCHANT, Charles Edward Jr. Born 12-13-1942, died 1-20-1943 - Son of Charles and Lillian (Miles) Merchant, Sr. MILES, Nina M. (Potter). Spouse of Joseph O. Born 1895, died 19?? MILES, Ronald E. Spouse of ?/ Marie E. McCaslin. Born 10-16-1918, died 10-18-1992 - Wed 10-3-1052 in Greenwood NY, eleven children. MILLS, Betty W. Born 1932, died 19?? MONROE, Bertha T. Born 1877, died 19?? MONROE, Emmer B. Spouse of Nancy Morley. Born 7-12-1827, died 7-8-1895 - Wed 1-23-1858, 6 children. MONROE, Nancy (Morley). Spouse of Emmer B. Born 1-8-1840, died 5-25-1908 - Dau of Hastings, Sr. and Nancy (Hunt) Morley, born in Gold. Wed 1-23-1858, 6 children. MOORE, Annice E. Spouse of Leroy L./ Henry Rogers/ Oliver B. Jordan. Born 1855, died 3-17-1917 - Wed Leroy in 1874, 4 children. Wed Henry in 1900. Wed Oliver in 1904. MORLEY, Betsey E. (Young). Spouse of Chester H. Born 6-4-1914, died 12-20-2005. Age: 91 - Dau of John and Pearl (Eddy) Young. Nursing Assistant at Charles Cole Hospital. Wed 9-25-1935 in Whitesville NY, 6 children. MORLEY, Chester H. Spouse of Betsey E. Young. Born 8-24-1914, died 5-29-2009. Age: 94 - Son of Seth W. and Mary (Williams) Morley. Wed 9-25-1935 in Whitesville NY, 6 children. A farmer and a gravedigger. MORLEY, Ephraim B. Spouse of Mary Nicholson. Born 8-9-1834*, died 10-30-1915. Age: 81y 2m 18d - Son of Hastings, Sr. and Nancy (Hunt) Morley. (1850 Allegany census) - Civil War Vet, Co B 171st PA Vols, Pvt. Mustered out with company on August 7, 1863. MORLEY, Grace. Born 1887, died 19?? MORLEY, Henry. Spouse of Aurilla. Born 1825*, died 2-2-1854. Age: 28 - Killed in a lumbering accident. MORLEY, James Jackson. Spouse of Minnie M. Conable. Born 4-6-1862*, died 10-5-1946. Age: 84y 5m 29d - Son of William S. and Susannah (Ardrey) Morley. Four children. MORLEY, James K. Born 1843, died 10-1-1917 - Prob son of Hastings, Sr. and Nancy (Hunt) Morley, born in Gold. MORLEY, Minnie Mae (Conable). Spouse of James J. Born 2-8-1868, died 1-14-1919 - Dau of Seth W. and Sarah (Burrous) Conable. Four children. MORLEY, William Shirts. Spouse of Susannah Ardrey. Born 1831, died 1872 - Son of Hastings, Sr. and Nancy (Hunt) Morley. Wed 7-1854, prob in Gold, 4 children. (1850 Allegany census) - Civil War Vet, Co B 171st PA Vols, Pvt. Mustered out with company on August 15, 1865. PALMER-FULLER, Gloria. Spouse of Edward Fuller. Born 10-5-1930, died 12-14-2014. Age: 84 - Dau of C. D. and Dorothy Palmer, born in Pittsburgh PA, died in Coudersport. Three daughters. Edward buried this cemetery. PEASLEY, Ebenezer. Spouse of Mary A. Born 1820, died 19?? PEET, Samuel. Born 7-25-1814*, died 12-19-1876. Age: 62y 4m 26d - Son of John and Sarah (Moorehouse) Peet, Sr.
PERKINS, Lloyd Arthur. Born 1914*, died 6-17-1931. Age: 16 - Son of Floyd and Myra (Galpin) Perkins. PERKINS, Philip E. Born ? ?, died ?? PERKINS, Robert Lee. Born 1937*, died 6-30-1944. Age: 7 - Son of Floyd and Myra (Galpin) Perkins. POTTER, Martha K. Born 1908, died ?? PRESHO, Arthur L. Spouse of Sarah Conable. Born 2-28-1853*, died 2-26-1877. Age: 23y 11m 26d - Wed 2-5-1876 in Raymond. PRESHO, Nellie. Born ? ?, died ?? PRESHO, Theadotia. Spouse of Albert G. Born 8-1841*, died 7-29-1868. Age: 26y 11m - First wife. RAMSEY, Eleanor H. Spouse of Jack. Born 10-25-1905, died 10-3-2002. Age: 96 - Dau of Theodoreus C. and Anna May (Stevens) Howe. Licensed practical nurse and oldest member of the Gold church at the time of her death. RASZMANN, Hazel (Langan) Ahearn. Spouse of Charles D. Ahearn/ Frederick. Born 10-13-1917, died 7-17-2006. Age: 88 - Dau of Frank and Rachel E. (Parsons) Langan. 6 children, sons surnamed Ahearn. Wed Frederick Raszmann 2nd. RAYMOND, Amos . Born 8-13-1782, died 1-30-1870 - Son of Amos  and Alice (Joslin) Raymond. RAYMOND, Daniel. Born ? ?, died ?? - Civil War Vet, NG1862K, PA Vols, Pvt. RAYMOND, Mariam H. D. Corey. Spouse of Amos Jr. Born 1838, died 1919 - Wed Amos 3-15-1878 at Emporium PA.
RAYMOND, Mary (Cutler). Spouse of Asa A. Born 1850, died 1911 - Dau of Harvey and Harriet (Welchem) Cutler. Wed 12-29-1875 in Bingham. ROGERS, Henry. Spouse of Maggie/ Annice Moore. Born 6-22-1835, died 5-29-1901 - Wed Annice in 1900. (1880 Allegany census) - Civil War Vet, Co H, 46th PA Vols, Cpl. Discharged on Surgeon's Certificate on March 12, 1863. ROGERS, William. Born 1829*, died 4-1-1865. Age: 36 - Civil War Vet, Co D, 53rd PA Vols, Pvt. Died on April 1, 1865 at City Point, Va. Of wounds received in action. SCHULER, Dora (Raymond). Spouse of Floyd C. Born 1888, died 1983 - Sister of J. Spafford and Daisy Raymond. SCHULER, Floyd C. [Doc]. Spouse of Dora Raymond. Born 1-10-1889, died 2-19-1965 - WW I Vet, 1st Lt.
SCOVILLE, Ira L. Born 10-30-1889, died 2-21-?? SMITH, James H. Born 1893, died ?? SNYDER, Katie E. (Davey). Spouse of Lawrence D. Born 1904, died 19?? - Wed 12-24-1919. SYLVESTER, George. Born ? ?, died ?? WEAVER, A. Kingsley [Kingsley]. Spouse of ?. Born 2-2-1848, died 2-18-1920. Age: 66 - Survived by wife. WEAVER, Joe. Born 1880, died 19?? WEAVER, Lillian (Pepperman). Spouse of Harold M. Born ?? WHITNEY, Mary (Raymond). Spouse of Willard S. Born 9-11-1838, died 9-28-1916 - Dau of Daniel and Amanda (Freeland) Raymond. WHITNEY, Willard S., Dr. Born 9-27-1820, died 4-2-1909 - Brother-in-law of Asa and David Raymond. WILLIAMS, Joseph T. Spouse of Mariah McMasters/ Martha A. Gardner. Born 1-24-1819, died 10-20-1899 - Son of John and Nancy (Thompson) Williams. Born in Spencer NY. 7 children with Mariah. WILLIAMS, Maria. Born 1820, died 1874 - Prob first wife of Joseph T. Williams and mother of his 7 children. WRIGHT, Andrew. Born ? ?, died ?? WRIGHT, Elizabeth. Born ? ?, died ? ?